Show your love and affection to your loved ones on their birthday with a custom greeting card designed in Canva. On your loved one’s special day, they certainly deserve a special card that’s personalized and created especially for them. Skip the generic, store-bought kind and use Canva to design a truly customized card filled with your well-wishes and blessing. Nothing in the world can replace the charm of a custom birthday card. So, whether it’s your best friend, a family member or even your boss – give them a memory, a card on their birthday they’ll cherish forever. Creating one that your dear ones will love and keep forever is easy thanks to Canva’s collection of joyous layouts & easy-to-use birthday card maker. Simply choose a design to begin with then edit as little or as much as you like. Before you know it, your unique birthday card will be ready to be gifted. 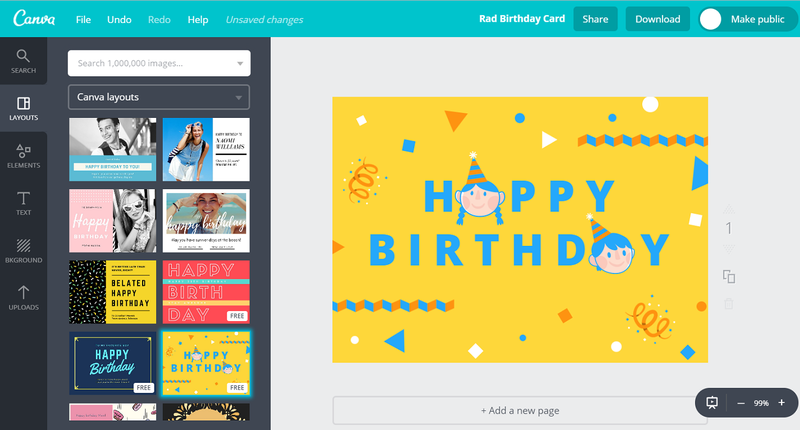 Create a new Canva account to get started with your own birthday card design. If you’re at a loss on how to start designing, the best place to start is in Canva’s templates library, filled with hundreds of designs and layouts that our awesome team of designers have come up with. There are templates for almost every age group, theme or person. There are colorful templates featuring colorful patterns, cake, and macarons or simpler styles like minimalist, elegant and modern. Whether you’re sending the card to a colleague, a sibling, a parent or your BFF, there’s sure to be a design you can use as your springboard. Make these beautiful templates even more special by adding personalized messages. Canva’s text tools have a wide range of pre-made font combinations, and tyopography and 130 free fonts to choose from, ensuring your card looks awesome. We don’t give the same presents to all, so why settle for the same birthday greeting? Create personalized greetings for all your loved ones with Canva by uploading cherished memories from yester years. All you have to do is click on the green ‘Upload your own image’ tab and select any JPEG, PNG or SVG file in your computer. The best part is, you can add as many photos as you want for free. If you wish to add more than one photo on your card, don’t forget to use Canva’s Grids & Frames tool to create a stunning birthday collage. Are you are falling short of images? Don’t worry, you can choose from our built-in media library with 1 million professional photos, illustrations, and graphics perfect for any occasion. Many of these images are free, rest priced at just $1 for each one-time-use. Make sure that before your loved ones blow their cake candles, your card is delivered. With Canva you can quickly send your well-wishes online as an e-card. You can send it via email or share on Facebook, Twitter or even LinkedIn. All you have to do is click on the Share button and choose the desired medium. You can also Download your card and send it through various messaging apps such as WhatsApp. Otherwise, If you don’t want to miss their live reaction, you can get your card printed in stunning resolution and hand it over yourself. Simply click on the download button and choose the PDF-Print option, this saves your birthday card at 300 DPI (dots per inch), which is professional print quality. Is it mandatory to create an account on Canva? If you are planning to design a greeting card on Canva, the first step is to create an account. The benefit of creating an account is that all your designs get saved at one place, and you’ll be able to reuse or edit them later. Also, by signing-in, you’ll be able to share your design with other Canva users. Can my friend and I create a birthday greeting card in collaboration? Yes! you can collaborate with as many people as you want to create a greeting card. All you have to do is share your design with the concerned person by clicking on Share tab and selecting ‘Share/email as an editable design.’ It will enable your friend to access the design on their personal Canva account. Can I reuse the already created birthday greeting? Yes, Canva saves all your designs in your account. You can reuse these designs anytime you want and edit them as well. So, the same birthday card can be reused for different individuals with little or no changes at all.